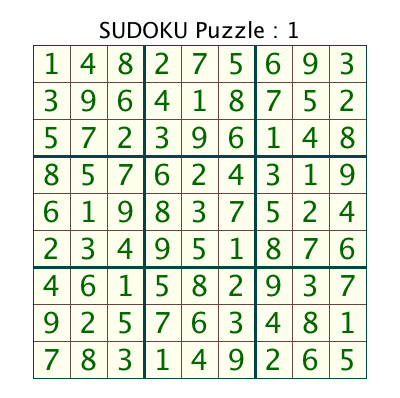 The following graphics show a Sudoku puzzle in the Crossword Express Solve screen and a PNG graphic file produced by the program's print function, showing the complete puzzle solution. See also a full size version of a PDF file. Fully automatic construction of puzzles at any of 19 different difficulty settings ranging from trivial to VERY hard. Fully manual construction is also available. This allows puzzles found in the printed media to be entered into Crossword Express. Sudoku puzzles are normally constructed using numbers, but if you prefer you can specify a set of nine letters which will be used instead. A multi-build function allows the construction of many puzzles (thousands if necessary) in a single operation. On-screen puzzles can be displayed in an unprecedented range of user controlled colors and formats, and these choices can optionally be applied to the printer also. Output can be sent direct to the printer or, if you prefer to a PDF file. Mac users can do this by using the PDF facility of their printer driver, while Windows users can install the appropriate software to achieve a similar result. The recommended software for this purpose is Primo PDF which you can download free from their website, although you might consider sending them a small donation if you find their program useful. Formatted output can also be exported from the Print screen to graphic files which conform to the BMP, GIF, JPG or PNG formats. Naturally, color settings can also be applied in these cases. A fully interactive Solve function is available to allow you to solve the puzzles "on screen" without needing to print them. 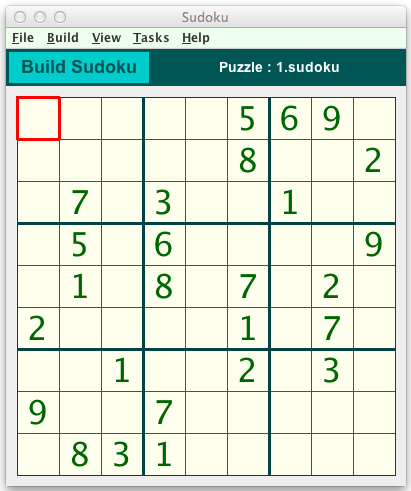 If you are new to SUDOKU puzzles, here is an extensive tutorial which will quickly turn you into an expert.